With the Catalonia crisis making international headlines, the unique cultural and geographic region bordering Spain and France has once again moved to the center of the world’s attention. In The Savage Frontier, acclaimed author and journalist Matthew Carr uncovers the fascinating, multilayered story of the Pyrenees region—at once a forbidding, mountainous frontier zone of stunning beauty, home to a unique culture, and a site of sharp conflict between nations and empires. Carr follows the routes taken by monks, soldiers, poets, pilgrims, and refugees. 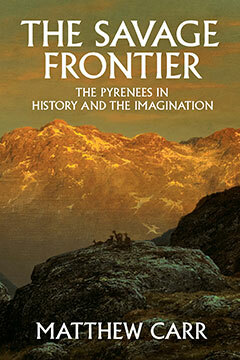 He examines the people and events that have shaped the Pyrenees across the centuries, with a cast of characters including Napoleon, Hannibal, and Charlemagne; the eccentric British climber Henry Russell; Francisco Sabaté Llopart, the Catalan anarchist who waged a lone war against the Franco regime across the Pyrenees for years after the civil war; Camino de Santiago pilgrims; and the cellist Pablo Casals, who spent twenty-three years in exile only a few miles from the Spanish border to show his disgust and disapproval of the Spanish regime. The Savage Frontier is a book that will spark a new awareness and appreciation of one of the most haunting, magical, and dramatic landscapes on earth.